In the early 1900s, playing hockey could lead to fighting for your country. The skills that made you a good hockey player—strength, endurance, patience, toughness—were desirable to the army. In its rough-and-tumble way, hockey was seen as a way to prepare yourself for war. The best soldiers were often hockey players and many players volunteered to fight in the First World War. Allan McLean “Scotty” Davidson was one of those volunteers. Born on March 6, 1891, in Kingston, Ontario, Davidson began playing hockey with the Kingston Junior Frontenacs. As their captain, he helped the team win the Ontario Hockey Association Junior Championship in 1910 and 1911. The next year, Davidson moved to Calgary to play for the Calgary Athletics’ senior team. They won the Alberta Cup in 1911–1912 but lost their challenge to the Winnipeg Victorias for the Allan Cup (Canadian Senior Championship). In 1912, Davidson started playing professionally for the Toronto Blueshirts (now Toronto Maple Leafs) in the National Hockey Association. Davidson was the team’s captain and leading goal scorer the next year and helped win Toronto’s first Stanley Cup in 1914. In his two seasons with the Blueshirts, Davidson scored 46 goals in 44 games. He could skate backwards faster than most players could skate forwards, according to Edward Allan, a hockey writer for the Toronto Mail and Empire newspaper. 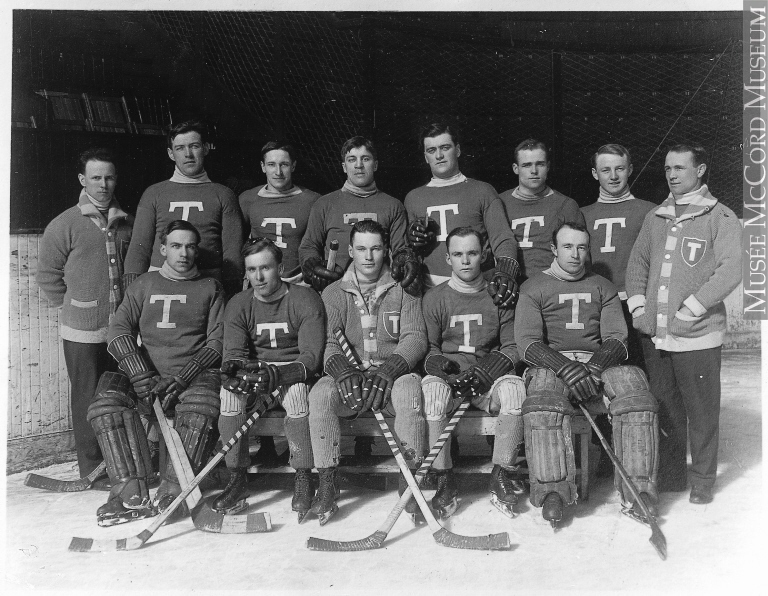 Toronto Blueshirts, Stanley Cup Champions of 1914. Scotty Davidson is in the centre of the front row. Photo courtesy of the McCord Museum. As a star hockey player, Davidson had all the skills the army was looking for. He may have been the first professional hockey player to enlist in the Canadian Expeditionary Forces (CEF), joining in September 1914. Scotty volunteered to be a “bomb thrower”, lobbing grenades at enemy troops. Some newspapers carried stories about Davidson in the army and described his bravery in the face of danger. Scotty Davidson died in the field on June 16, 1915. 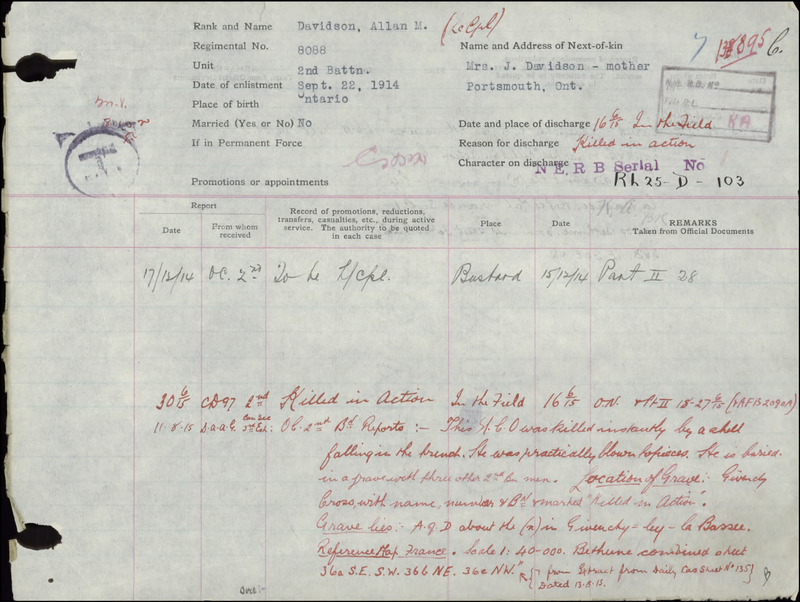 His CEF service file states that Davidson “was killed instantly by a shell falling in the trench. He was practically blown to pieces.” A newspaper account of his death claimed that Davidson would have earned the Distinguished Conduct Medal or the Victoria Cross if he had survived the battle. Fellow soldier and Kingston resident, Captain George Richardson said Davidson was one of the bravest men in his company. He was fearless, willing and ready to save his comrades at every opportunity. Davidson’s name is memorialized on the Canadian National Vimy Memorial in France. Scotty Davidson sounds like the type of athlete I would have loved to watch play hockey. He was a smooth skater, a goal scorer and a leader. In 1925, Maclean’s magazine named Scotty the top right-winger in its all-star team of the best hockey players. An opposing coach, Ernie Hamilton, said about Scotty’s shot, “I never saw such hard shooting.” The roots of our freedom are founded on the lives of people such as Scotty. He was a glorious athlete whose life was cut far too short. Scotty Davidson was inducted into the Hockey Hall of Fame in 1950. Scotty’s sacrifice is honoured by the Canadian Virtual War Memorial. Ellen Bond is a project assistant with the Online Content Team at Library and Archives Canada.